I have to admit that I had my doubts about this recipe. While I was coating each avocado wedge in almond flour and sesame seeds, I couldn’t help but think that it was a waste of time (and two ripe avocados) to bake them when they tastes perfectly good au natural in a salad. We’ve done some previous baked avocado experiments and even if some of them were pretty good, they were honestly just as good raw. But David had his mind set on these. He said that “They will almost look like fried chicken wings” which made me exactly zero percent more keen on the idea. 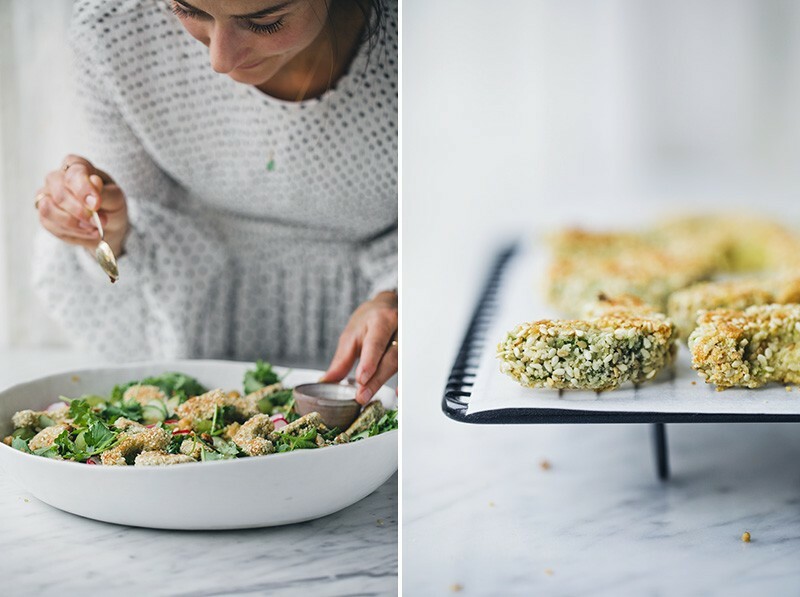 But when we took out the tray with golden crusted sesame avocado wedges from the oven, they did actually look pretty good. The texture really is key here. The crust is firm and crunchy and when you bite into it the avocado inside almost melts with softness. The almond flour gives the crust a sweet nuttiness. Since we wanted to keep this recipe vegan, we tried aquafaba (chickpea brine) instead of egg to bind the coating to the avocado flesh and it worked like a charm. It holds the coating firmly in place and you can’t taste it at all. 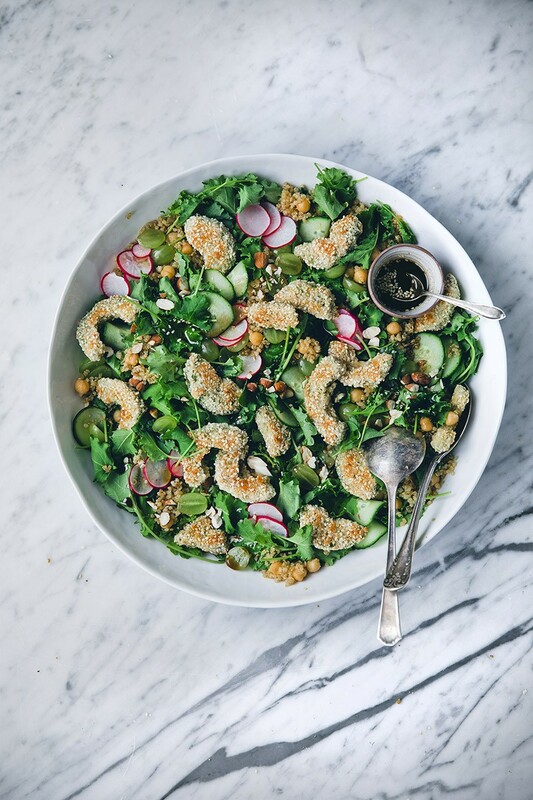 I also love the idea of using chickpeas in a salad and the brine for coating. No waste! So, for all you avocado lovers that already eaten your own weight of guacamole, avocado toasts, avo-choco mousse and other desserts. Here is a new one for you to try. You can make these as snacks and serve with a dipping sauce. I imagine a sweet soy-based dip, chimichurri, srirachamayo or yogurt dip would be good. 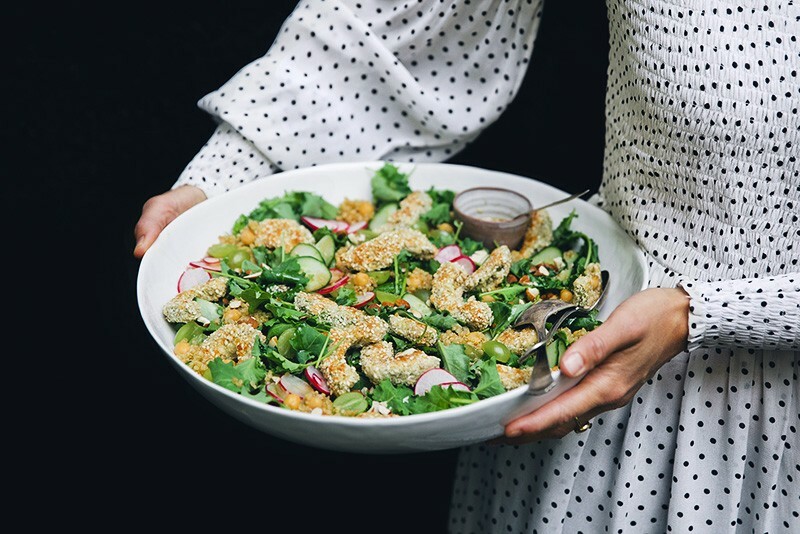 In this recipe we have instead used them in a simple salad with quinoa, chickpeas and green grapes and Asian flavored dressing that pairs great with the sesame crust. Set the oven to 200°C / 400° F. Place a baking paper on a baking sheet. Cook the quinoa in 1 cup / 250 ml salted water for 15-20 minutes, until small tails appear on the seeds. Open the chickpea tin. Pour the brine into a small bowl and rinse the chickpeas. Add lemon juice to the brine and set aside. Stir together almond flour, sesame seeds and salt in a second bowl. Cut the two avocados in half and remove the stones. Take off the peel and slice the avocado into thick wedges. Dip each wedge into the brine and then in the almond and sesame coating, turning it to make sure it is entirely coated. 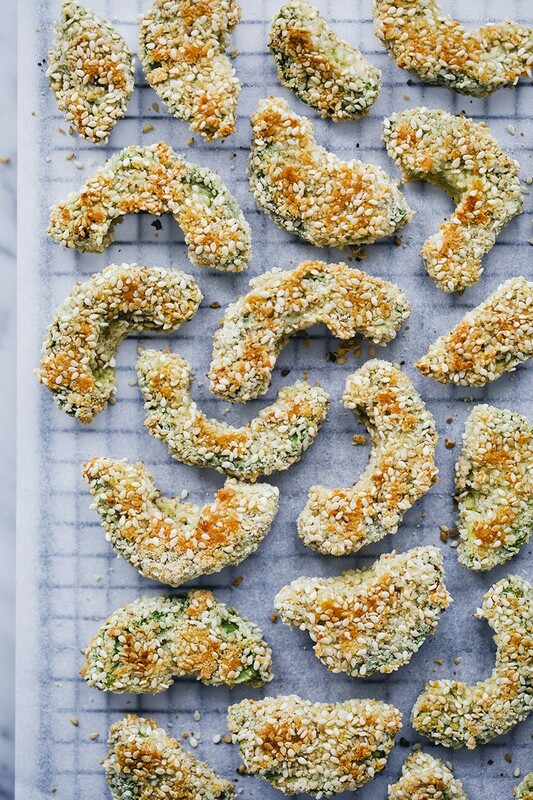 Spread out the coated avocado wedges on the baking sheet and bake for 15 minutes or until the crust is golden. Stir together the dressing and pour half of it over the cooked and drained quinoa and the rest into a little dressing jar. Add the chickpeas and toss to combine. Arrange the quinoa in the bottom of a wide salad bowl. Add lettuce and then scatter green grapes, radishes and cucumber slices across the bowl. Top with the sesame crusted avocado wedges and toasted almonds. Drizzle the rest of the dressing over the salad right before serving. Enjoy!